During Obama's unveiling of plans for his upcoming Presidential Library and Center, the former POTUS revealed his young ambitions of being an architect. During yesterdays events, he proclaimed "I wanted to be an architect when I was a kid. Somehow, I took a wrong turn." Back in June, Obama chose architects Tod Williams and Billie Tsien to design the foundation, but the community-organizer from Chicago has remained quite active in the planning process for his building, even sending the team back to the drawing boards after finding their initial design a little too quiet. The proposed Miesian roof/landscape urbanism building is very much like what they successfully did in Prospect Park. I've been to 5-6 major public buildings by TWBT now. Went wanting to like them, but all disappointed, landed with a thud. Agreed. I like the direction though. Works well with Park space, formal yet approachable geometry. Also, I think the Obama Library design has great potential as a monument/anti-monument/landscape. I agree with David Huber. I disagree with David Huber. Yes, it is! Love that we're both featured comments, davvid! Looked twice when I saw the Gene Demby retweet. Demby nailed it. BO should take his $65m book advance and redevelop some rundown area rather than appropriate an historical park. Just for clarity, Demby didn't write the piece he tweeted out. 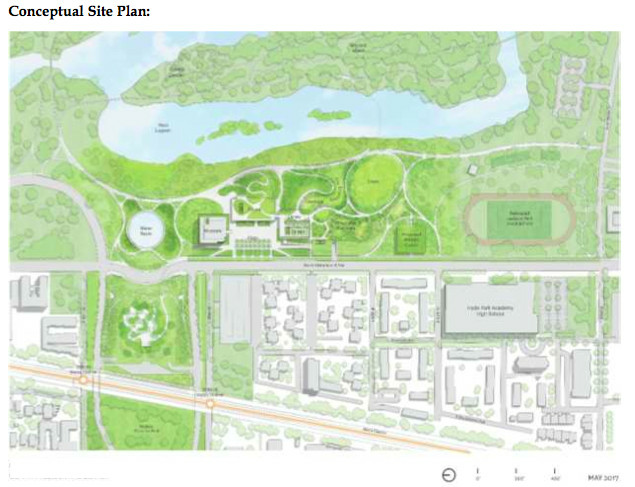 The Obama Foundation was supposed to come up with a plan to rebuild the athletic fields at their expense, including four (?) baseball diamonds and a regulation football field enclosed by a running track, that are going to be destroyed building this thing. To date nothing from the Foundation. Volunteer, if you look at the site plan the football fields shifts south along Stony Island, so it is still there. As for the softball diamonds, not sure. I could see the Rahm-esque shift them to another park. According to this map the football field and track is a goner, along with the ball fields. If you look at the site plan presented by the foundation, the football field is directly south of the museum. I take no issue with the siting or the loss of the athletic fields as long as the new building is designed to be a community asset that is welcoming to its neighbors. Curious how parking will work and all the normal concerns that go into an institutional design that settles into a residential area. It appears there are baseball and soccer fields almost immediately adjacent to the site. Not sure what all the fuss is about. Of course ShittyLab offers the generic "you cant build in a park" take as opposed to reacting to the specifics of THIS design. A take easily swatted down with TWBTA prospect park work and the MET (and other buildings) in Central Park. It's not a condo, it's a specific design finely integrated into the landscape. While I don't entirely agree with the critique by Capps, this project has more to do with the Big Mound in St. Louis than it does with "the landscape" as a physical context. What is does point out is the desire to place these monuments in an imagined sublime "landscape." The bottom line is that he wanted to be a close a possible to the University and other "cultural spaces" (the science museum), with the least amount of work and the greater amount of impact- as demonstrated by the location of the reflecting pool. So this isn't a landscape- this is urban design project. But why is there so much attention being paid to this presidential library proposal in the 1st place? Because it is for the last black president? I'm not sure about that because there shouldn't be racism regarding the ethnic background of who can be President of the U.S. I don't believe the U.S. should be returning to racist dominated values. Are you saying that Twitter is irrelevant?! This is disappointing if true... "President Barack Obama himself told residents that he would not sign a benefits agreement, which would put into writing the promises the foundation has made thus far on bringing jobs, economic development and resources to the South Side." Wonder why, worried about setting a precedent? This makes absolute sense to me. Proformas are designed to maximize capital, not opportunity. Furthermore, it was never the intention of the Presidential Center to create opportunities for the surrounding community- nor can I think of any that were intended to accomplish that task. If this were actually the case, it would be a very different project, programmatically and formally. However, somehow we are projecting an altruistic attitude on it, despite the history and patterns that suggest otherwise. I do find it a little ironic that Obama personally said that the Foundation will not sign a CBA. Here in Detroit every project that uses public land or public subsidy on projects over $75M requires a CBA. CBAs are standard operating procedure for most left-leaning city councils and community development organizations. Evidently Obama didn't receive the memo from his community organizing friends - or CBAs are great as long as they don't affect you. BO works for Wall Street and they are not interested in community development. Q: Do academic institution and similar nfp's fall under this requirement in Detroit? 1. It is in the wrong place!!!!!!!!!!!!!! 2. It removes public open space!!!!!!!!!!!!!!!! ​Apparently, exclamation points are on sale at Costco.